Technical functionality is all the rage at the moment in the moto-verse. The demand for motorcycle specific protection that is still fashionable and usable off of the bike is at an all-time high and Dainese is looking to expand its already varied range of such gear moving forward. The Dainese Street Biker Air Shoes offer an alternative to summer riding shoes with perforation and a luxurious look and feel. The suede construction has a lightweight, casual style with permanent reflective strips on the heel for extra visibility. These shoes also have additional features such as nylon inserts on the ankle, heel and toe reinforcements to make these a safe alternative to your favorite basketball style sneakers. At the same time, they are also CE certified and have high tenacity fabric inserts to ensure you’re getting more than a cool, stylish sneaker. 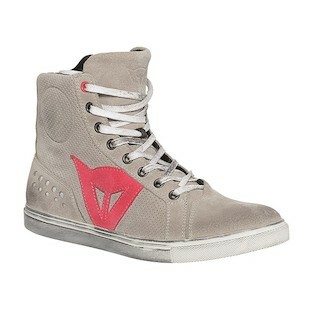 The Dainese Women's Street Biker Air will also be an option. Designed to better fit the ergonomics of a feminine foot, this shoe will have all of the same great features as the Men's version, just with a better fitment for the petite foot. Also, it will come in 3 alternative colors! 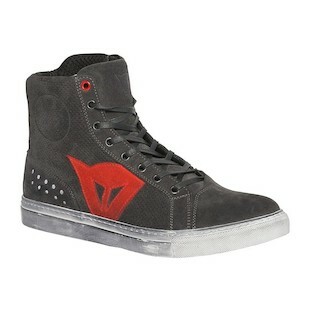 So stay light, stay comfy, and check out the new Biker Air Shoes from Dainese.